Amin Recommends & FAQs - Welcome to Amin`s Angel Tattooz and piercings studio, training and tattoo material supply in Hyderabad. The tattoo portion will then be thoroughly cleaned and shaved. Beginning to make the tattoo, starting from the line work followed by shading and coloring. Things you MUST know before you get inked!! Tattoo industry is growing rapidly and it is one of the fastest and booming industries of India. Starting from the young to the very old, most of them want to get atleast one tattoo done in their lifetime. In the modern world, tattooing has become an identification symbol for the majority of our entertainers (e.g. Movie starts) who are often seen flaunting their tattoos thus creating a trend. Every tattoo that a person has inscribed on the body has a symbolic meaning or sometimes it is just a fashion statement. As the demand for tattoo rises it would also give rise to unprofessional untrained individuals who want to get into the groove without prior expertise. Hence choosing the right tattoo artist should be of utmost importance. There are innumerable tattoo artist and studios coming up everywhere which would make it difficult to pick the right one. Research your artist: Look into who you trust your body with. Do a thorough research and choose an artist in advance, and look over their portfolio before committing, or get a recommendation from a friend who already had a positive experience working with the artist. There are unprofessional, irresponsible people who tattoo the wrong way. You can get scarred and/or infected if you end up getting work from a sub-par artist. The artist’s work should be available online on the official website. Make sure you’re happy with their work and that their style fits yours. Reading reviews on Facebook, Google etc will also help you pick the right artist. Non sterile tattoo practices can possible lead to infectious organisms such as Hepatitis B and tuberculoses. To limit the risk, always get tattooed in a safe and professional tattoo studio. Make sure that the studio is a place were you feel comfortable and relaxed. When walking into a tattoo studio for the first time, do not be afraid to ask questions. Be sure that the needles are opened in front of you. Be sure all the reusable materials are sterile in autoclave. Make sure that the work area is clean and free of dust. Do not let a friend try to tattoo you. Please leave it to the professionals who make this art their livelihood. They have the training and expertise to provide you with clean and safe service. Remember, this is a permanent investment, be sure to choose the tattoo studio that is right for you. Do not rely on information from friends about the care of your new tattoo. The artist will provide you with the proper care for the tattoo. To conclude, tattoos are an extension of you. They are just like painting or sculptures that do not need an explanation and yet speak volumes. Also, just to let you know, tattoos are very addictive. No one can have just one! Generally, most of this pain is bearable, but the places that have thinner skin tend to hurt more. These places include: but are not limited to differences in our bodies, the feet, head, under arms, ribs and spine. The more padding or fat under your skin the less it hurts. Most of the pain is also psychological. Our body also has a natural pain killer called “ENDORPHINS” which doesn’t completely take away the pain but they will lessen the feeling of pain for us. You absolutely need to control any fidgety, convulsiveness and jerky shakes during a tattoo. If your pain tolerance won’t allow you to remain still throughout the process, you may not be tattoo-able. You’re putting the dynamics of your permanent body art at risk. As one artist said, “There’s no room for error on my part. When it comes to mistakes, even if it’s your fault, it’s my fault. The artist takes the fall for 100% of screw-ups.” Hence cooperate, stay still and be tolerant. The pain is bearable. 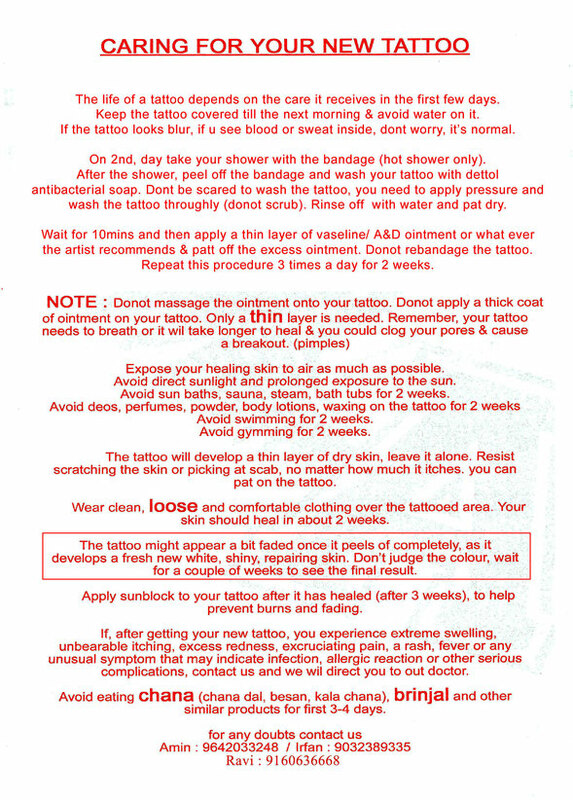 Procedure for making a painless tattoo is no different from a regular tattoo. However we add few additional steps that include application of the numbing ointment on the skin before starting the tattoo followed by anesthetic sprays at regular intervals while making the tattoo. *Numbing ointment: The area which has to be tattooed will be applied by the numbing ointment 2 hours before the tattoo making process begins. After 2 hours you either feel less pain or no pain at all. *Spray: The spray is induced by way of tiny drops or mists. It works immediately upon the cuts made while tattooing and temporarily makes the pain receptors on your skin go numb. Spray is used at regular intervals during the tattoo making process depending on the frequency of pain. Using this process, combined with our painless tattoo technique, our highly trained and experienced artists can help provide you with a painless tattoo experience. The best part is when your tattoo is complete, only you and your artist will know what a breeze it was! However anesthetics might not be efficient on big tattoos. 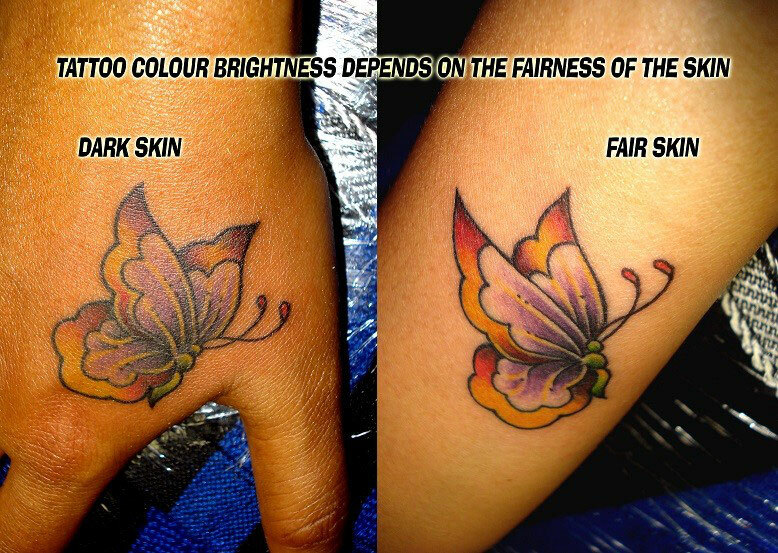 An important point to remember is that is the tattoo color will depend greatly on the skin tone of a person. Tattoo ink is deposited under the skin and remains in the layer called dermis, which lies under the layer of the skin you can see. It basically means that your skin tone and pigments will be on top of the tattoo ink, and the ink actually goes inside your body and leaves an imprint on the outer portion. For example: On a dark skin white may turn out to be cream. Individuals with tanned or dark skin should not opt for bright or glittery colors. Best option would be to opt for black and red, as any lighter shade would give your tattoo a faded look and also the colors won't be visible. Also bear in mind that a color tattoo will most likely fade off if you tan a lot. Hence while choosing a color, always consult your tattoo artist as he/she is a better judge of which color and patterns complement each other. NOTE : The internet is filled with a lot of different aftercares for tattoos, and not all artists follow the same aftercare. It can vary depending on what the artist feels best suits his/her work .It can also vary from country to country as the weather is not the same everywhere (some places are colder and few hotter) and also it can change as per skin type and many other different reasons. Please trust your artist and follow what he/she recommends as aftercare. Pay attention to what your artist tells you and do precisely what he instructs. He is a professional with experience and will certainly know what product and healing technique works best for their own work. Keep in mind, if you change the Aftercare for whatever reason the artist is not obliged to touch up your tattoo free of cost. It is your responsibility to take care of your tattoo once you leave the studio. Getting a tattoo requires your utmost concentration. Bringing your kids along is only going to ruin it. You will be occupied and the children will be running around touching things could really be an inconvenience to the artists. Tattoo studios are not a place for children. There are too many hazards for children to be exposed to. It’s an adult environment. Keep in mind you might be staying there for a couple of hours. Respect the decorum of the studio. If you don’t know what you want, don’t get tattooed. Tattoos are for life and if you get something you’re not 100% sure, you will end up hating it. Asking us what we think you should get is not correct. We just put the tattoos on. We don’t know what sort of things you like so we can’t make up your mind for you. We definitely offer suggestions, discuss, brainstorm the idea that you have but requesting concepts out of thin air is incorrect. Hence be sure of what and how you want and have a concept in your mind before getting a tattoo. The more clearly you can describe what you want, the quicker and easier we will be able to design for you. Wouldn’t we always keep up appointments made with doctors, lawyers and most importantly dates? So why shouldn’t tattoo artists by any different? A good artist would have his day, week and even months planned out. He might have back to back appointments in 1 single day. If you are late for your appointment, the next in line might also have to suffer the consequences and this would cause an inconvenience to the artist. Hence respect his time and be on time. This would create a good first impression on the artist which can go a long way in the future. This may all seem to be common sense but the reality is that, tattoo artists deal with breaches of this etiquette all day, every day. A little common courtesy and etiquette can go a long way towards making your entire tattoo experience much more rewarding and pleasant. HOW MUCH CAN A TATTOO COST ? Tattoo artists set their prices according to various factors like studio, location, hygiene, work, color, size, duration, detailing, quality, safety, custom designs, professionalism, experience, goodwill, expertise and many more. Hence expecting a uniform price range across studios is unrealistic. 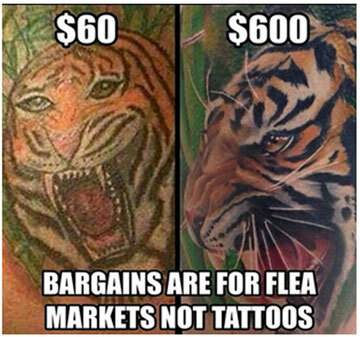 It is better to wait until you afford the price of a quality service from an experienced tattoo artist instead of bargaining over the prices and getting it done by a sub-par artist. It is important for you to consider this because you will end up wearing the tattoo for life. People spend thousands on electronics, cloths, shoes, food etc but have doubts and inhibitions on investing on something which is going to remain with them forever. Hence choose wisely. Tattoo industry is a place where price uniformity cannot be maintained, unlike the food and electronics market where the price is almost the same or with little variations across PAN India. There are many factors which determine the cost of a tattoo. Few are listed below. Size: If the size of the tattoo is big and complex and involves a lot of technicalities, it will take considerably more time to complete the process as compared to a small tattoo. Therefore if your budget is not sufficient, you should go for a smaller tattoo instead of looking for cheaper alternatives from inexperienced artists. 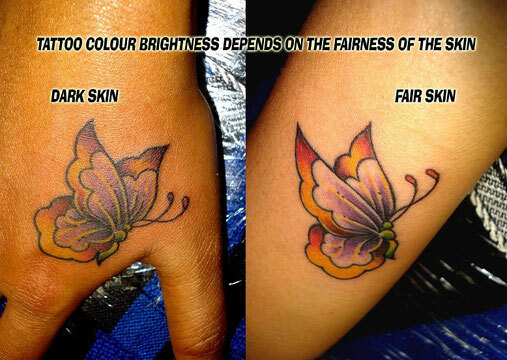 Colour: A full colored tattoo would cost more. You need to know that you are not paying more just for the color but because a color tattoo requires a lot of professional shading techniques to be used and is also a time taking process. Imagine painting a picture with just one color and another picture with 5 different colors. Also note that you are paying for the art not the materials used in making the art. Location: Tattooing is a business whose prices are also determined by the demand and overhead costs. If the parlor is located in a posh area or is at the heart of the city or is a tourist destination, the overhead costs will be higher, and this will reflect the standard, minimum and hourly rates. Design: Tattoo price is also determined by a design. A simple design can take an hour, and this will be relatively cheaper as compared to a complex design which can take more than 4 hours. The artist puts in a lot of thought and back breaking effort into creating a custom design which suits your idea and style. Hence tattoo price can only be determined after understanding what and how exactly you want to get it done and the complexities involved. 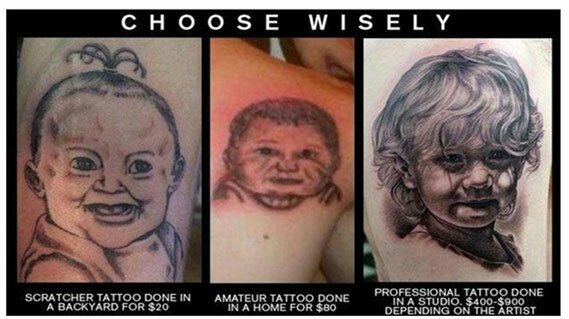 Artist: Artists credibility also determine the costs of tattooing. It is fixed according to their experience, goodwill and expertise. A Picasso’s painting may cost you 1000 dollars but you wouldn’t be willing to pay the same amount to another artist who painted the exact same picture. It all depends on the brand and the goodwill an artist carries. A celebrity tattoo artist’s price might be more; people would be willing to pay him more as he has a brand attached to him. Hence uniformity of prices across all the artists is unreal. Cost is fixed according to every individual artist. Hygiene and Safety: The more an artist follows hygiene and safety procedures, more the overhead costs, better the standard of safety and hygiene. But not every studio follows it, at the end it is you who needs to observe and decide on the level of hygiene maintained by the artist. A good artist would use disposable needles, gloves, razors, ink cups, clip cord covers (Cover the tattoo tattoo machine wires), tattoo machine, spray and squeeze bottle covers, cling wrap the tattoo work station area , use rubbing alcohol spray (sanitizer) to clean the tattoo area and to sanitize the bed, work table, lamp etc.., autoclave (Used to sterilize stainless steel tips, studs, tattoo grips, forceps etc), needle burner (Used to dispose used needles), use fresh tissues to wipe off excess colour, green soap (medicated liquid soap to clean a tattoo), use branded inks, needles, ointments, antiseptic lotions and tattoo equipments. Following all the above procedures requires an investment and thereafter raises the overall cost of a tattoo. Hence higher the standard, higher the price. A GOOD TATTOO ARTIST WILL BE HONEST, not every part of your body is tattooable. A good artist will warn you about the potential complications and maybe even refuse the work if they feel the end result wouldn’t look good or heal well. He would follow age restriction and wouldn’t agree to go ahead unless and until the person is an adult and is above 18 years of age. He would also recommend you about the correct placement of the tattoo. Not every part of the body is apt for a tattoo; some places on the body reject ink in less than three weeks. An honest tattoo artist will make you aware of the same. He wouldn’t do the tattoo just because you wanted it so. Majority of their business relies on referrals, their art is an advertisement. Your body is their canvas and you carry the art everywhere you go so a good artist wouldn’t wish to keep their reputation at stake. 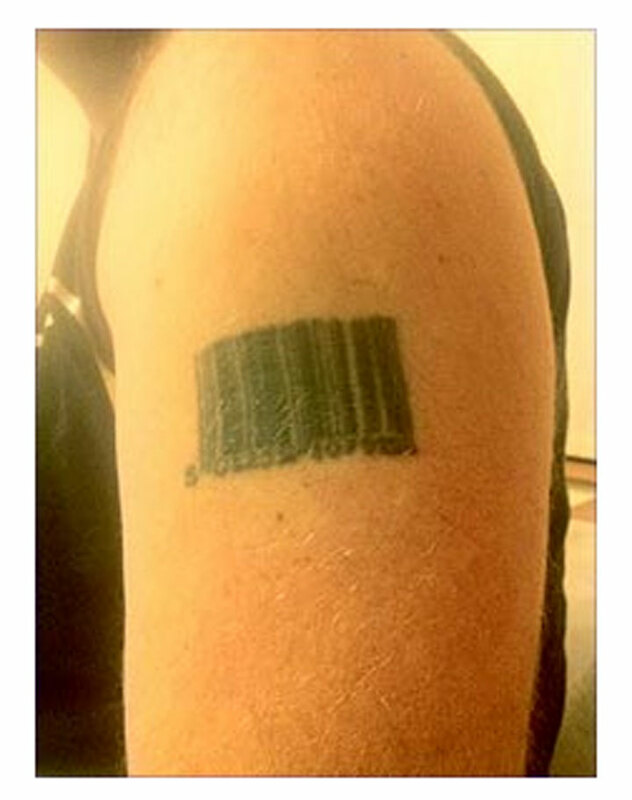 ISN'T A Rs.300/- TATTOO SAME AS A Rs.3000/- TATTOO ? We all eat noodles, noodle is available at a roadside stall for a mere Rs. 25/-it is also available at a decent eatery for Rs. 150/- and also at a 5 star hotel for may b Rs. 300/-All 3 places serves noodles but still why the price difference ? Guess we don’t need to explain that!! YOU GET WHAT U PAY FOR. Factors like quality, hygiene, place, environment, credibility, service, ambiance etc together determine the price charged. Similarly, tattoo prices may also vary from artist to artist, studio to studio depending on the above mentioned factors, but unlike food where you still have the option to leave the food half way, a tattoo is a lifelong commitment. Once a bad tattoo always a bad irreplaceable tattoo on the body. Thus choose your artist and place wisely. Spending a few extra bucks on a genuine tattoo place is wiser than a bad tattoo gotten and regret for life. AM I PRONE TO DISEASES LIKE HEPATITIS, HIV, SKIN CANCER ETC IN A TATTOO STUDIO ? No its not, until you follow all the necessary precautionary measures given below. Whenever I visit a doctor or a dentists clinic and when I was in an operation theater for a minor surgery, I always wondered, do they use fresh syringes for all their patients? Are the syringes, forceps (scissor like equipment) etc sterilized and not expired because I never get to see them or scrutinize them? Is the same thermometer clean enough to b put into every patient’s mouth? Is the place hygienic enough, is the bed clean? Am I not at risk of infection or disease or contamination at these places? Ofcourse there are health risk even at these places, but only if the above mentioned points are not followed properly. Similarly, we often receive queries at our tattoo studio asking us weather we use fresh needles, quality products and weather we follow all the hygiene procedures and can a tattoo studio give a person an infection, allergy or a disease and if the client’s health is at risks? Yes!! A tattoo studio can also cause health hazards but only if the above mentioned factors r not followed properly. But please note: A tattoo studio is not the only place that can cause health risks; a doctors, dentists and surgeons’ clinic carry similar risks. Thus, as we trust them we need to trust our tattoo artists too. But do your home work properly and make sure u choose a tattoo place wisely. Sometimes we see a person who has numerous tattoos all over his/her body and we naturally wonder, “Can all that ink on the skin be healthy?” There was not a single case reported in India of a tattoo causing skin cancer. Tattoos can cause localized skin reactions such as allergic reactions or rashes but are an unlikely cause of skin cancer. Any skin reaction to the tattoo is handled by infection-fighting cells directly at the location of the tattoo. The ink stays in the skin cells of the tattoo and does not spread into the blood or travel to other parts of the body. Chances of getting an allergic reaction, rashes or diseases are possible only when the tattoo artist do not follow the necessary safety measures and procedures. An experienced professional will know exactly how much pressure has to be applied for the tattoo to remain above the skin cells. An inexperienced person might apply too much pressure which might lead to bleeding and the ink getting in contact with the inner most skin layer into the main blood stream. And if the ink used by the artist is not branded and is contaminated or has already expired, it might lead to infections and rashes as it touches the blood vessels deep inside the skin. Hence always pick an artist who is reputed and follows the safety procedures religiously. See to it that he uses disposable needles, equipment and gives hygiene the utmost priority. can't i donate blood if i get a tattoo ? Ofcourse you can !! But advisably after 12 months of getting a tattoo. The misconception society has, that tattooed people's blood is contaminated is False. If u got a tattoo from a licensed professional who followed all the safety procedures and techniques, you need not worry at all. However you should wait for a period of 12 months as any risks arising out of a tattoo can take a years time to detect completely. This is a conversation we have with the clients on a daily basis, “Your tattoo needs to be bigger”. You might think that the artist is trying to squeeze in extra bucks. But this isn’t the case. Your tattoo may have to be bigger than expected if it has text or a face or other fine line details (Ex: barcodes, fairies or elaborate ornamental works). An inexperienced artist may not likely warn you of the implications of getting a tattoo too small because they will not realize the impact your ink can have 1 or 5 years down the lane, even if you do take great care of it. Of course frequent swimming, sun exposure etc can expedite the process but even the best managed skin will spread ink. 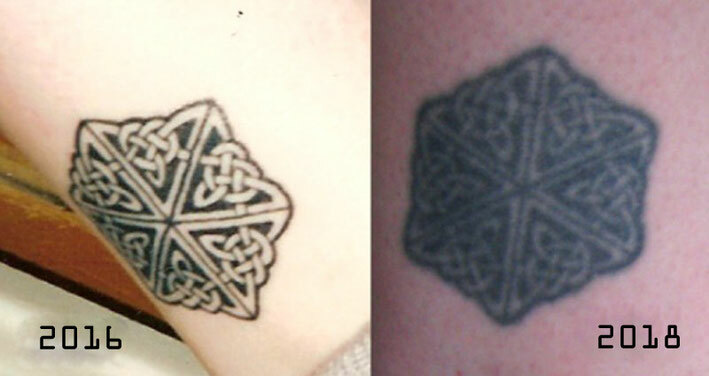 As the skin ages, tattoo ages as well. Your body is constantly making copies and copies of your skin cells and of your tattoo. Just like when you keep making photocopies of the document, the text will start to look progressively blurry. The same thing happens with your tattoo. It might look fantastic the day you get it done, but will eventually become blotted and you cannot undo a blotted tattoo! All in all size matters. 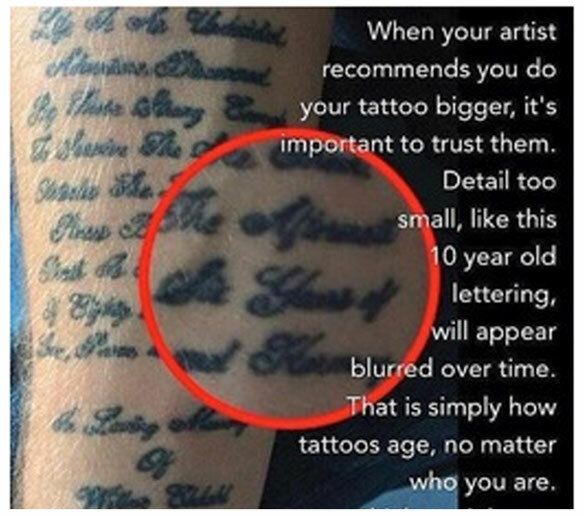 When consulting about your tattoo do not forget to ask the artist how age will affect the details of your tattoo and trust the artist and the suggestion given, especially if your tattoo is small. The reason many artists turn away requests for bar-codes.